Once again, I seem to have jumped in on the second book of a series. Fortunately, there was plenty of exposition detailing the events of The Super Life of Ben Braver. Maybe a little too much exposition. This sequel took a little long getting to its own story because of this, along with a bit of heavy-handed foreshadowing as well. Regardless of its slow start, Ben Braver and the Incredible Exploding Kid is a pretty standard middle-grade book that calls upon the success of the superhero genre to package a lesson about pride between action set pieces. While there are some parallels between the X-Men series, I feel the main character’s arc is perhaps a little more similar to early My Hero Academia. Plus, it wouldn’t be a middle-grade story without a bit of a Harry Potter feel to it as well (i.e., a unique main character with a semi-bumbling male friend and an incredibly smart female friend). At the very least, I found the illustrations sprinkled throughout to be well done. They certainly contributed to the comic book hybrid feel of the story, which is probably what draws the X-Men comparisons. I won’t fault this book too much for its heavy-handed approach toward the main character’s social faux pas since this book is basically for children. That being said, I did find some of the lore and intricacies of the greater story arc to be perhaps a little elaborate. I’m sure if I’d read the first book, this would be less so, but it still seems slightly overcomplicated at times. In the end, I liked some of the unique (if not sometimes gross) superpowers of these kids, and I’d recommend this series for any children who might want to make the jump from comic books to chapter books, and vice versa. 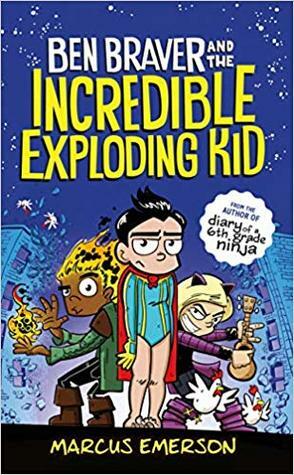 A comic book/chapter book hybrid with a semi-standard take on superheroes, I give Ben Braver and the Incredible Exploding Kid 3.5 stars out of 5.